It has dark red jagged lines. 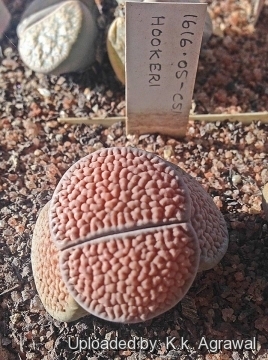 Origin and Habitat: 15 km NW of Strydenburg, South Africa. Habitat: L. hookeri grows on different kind of stony ground comprising transluscent quartzite; amygdaloidal lava; amygdaloidal lava with some sandstone; sheared micaceous quartzite. Colours grey-white, brown, pink, grey, some white, red. 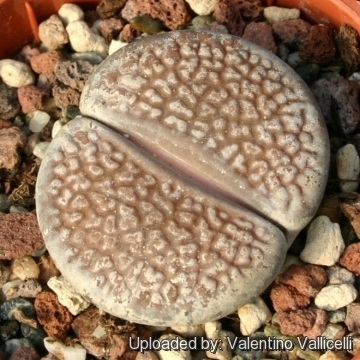 Description: Lithops hookeri is a medium to very large species, up to 46 X 35 mm, usually about 30 X 23 mm. with up to 10 or more heads (mostly 2-4). 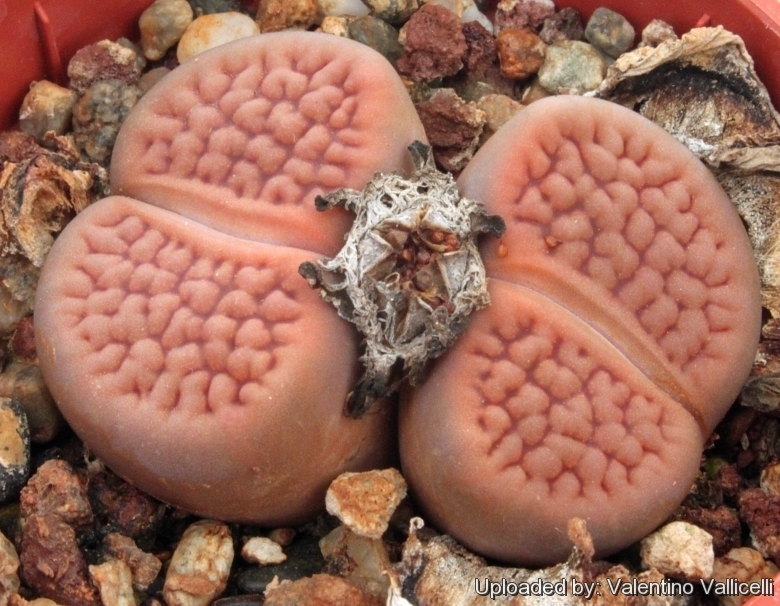 The bodies (paired leaves) are obconical, truncate, with the top surface flat to slightly convex. The face is elliptical more or less equal. The fissure is shallow 3-7 mm, the lobes are conjunct. This species is characterized by an obscure network of simple and forked groves and lines, and numerous irregular small island enclosed by groves. Margins are irregularly incise with narrow lines tapering out of the grows. This species is quite variable and the colours and face pattern varies considerably in plant from different provenance. 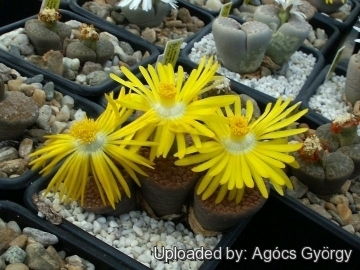 L. hookeri comprises several more or less intergrading and distinct variety. Desmond Cole field number C051 [vermiculate Form]: This population distinguishes for having dark red jagged lines. Cultivation and Propagation: It need an open mineral, fast draining mix and the maximum amount of light you are able to give them.